The unbeaten Karachi Ke Shehzade maintained their winning streak in Karachi Kings’ tournament Sindh Ke Shehzade as they crush Mirpurkhas Ke Shehzade by six wickets in an exciting match on Wednesday. Mirpukhas Ke Shehzade won the toss and opted to bat first, Karachi teams’ lethal bowling attack jolted the batting line-up of Mirpurkhas team as they lost early wickets and in the match. 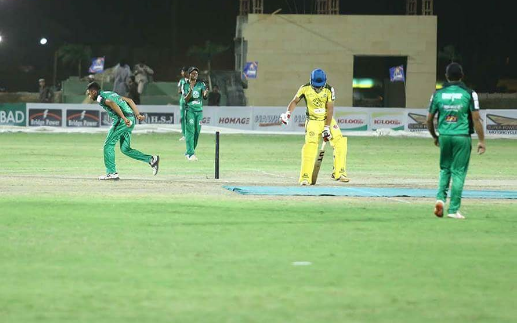 Mirpurkhas Ke Shehzade put 82 runs on board, in reply, Karachi Ke Shehzade chased down the target in 18th over. Mohammad Salman of Karachi Ke Shehzade bagged man of the match title for his outstanding performance. Earlier, Hyderabad Ke Shehzade outclassed Nawabshah Ke Shehzade by 118 runs. The tournament final is set to be played on Friday at Naya Nazimabad cricket ground.